When I was a kid, my dad had a great big shop in the basement of our huge old house on the East Side of Buffalo, NY. So big I could ride my big wheel around that shop when saws weren’t buzzing. In his shop, he had a large cast iron table saw, a full size band saw, a drill press, and many more large pieces of equipment. When my dad got to working, not one of those monsters had to be moved to make a cut or drill a hole. Fast forward to 2016 and enter the Ginger work shop. I have enough space to properly drill some pocket holes and lose a tape measure. That said, it doesn’t bother me one bit. What my dad taught me back in the day was to keep your shop organized and clean, and it won’t matter the size; great things can happen. Last year, as my kids got older and building things became possible, my wife so kindly gave up most of the garage in our home to this hobby. Soon, as she and her friend found pallets, and I cleaned up some boxes of old toys stored on the shelves, I had a bit more space. I quickly found new ways to store our kayaks upright and hand just about every tool that was less then 50lbs off the pallet shelves I made from their efforts. In 2017, after a winter of building with the garage door closed (meaning even less space), I continued to find new ways to improve the mobility of the shop. 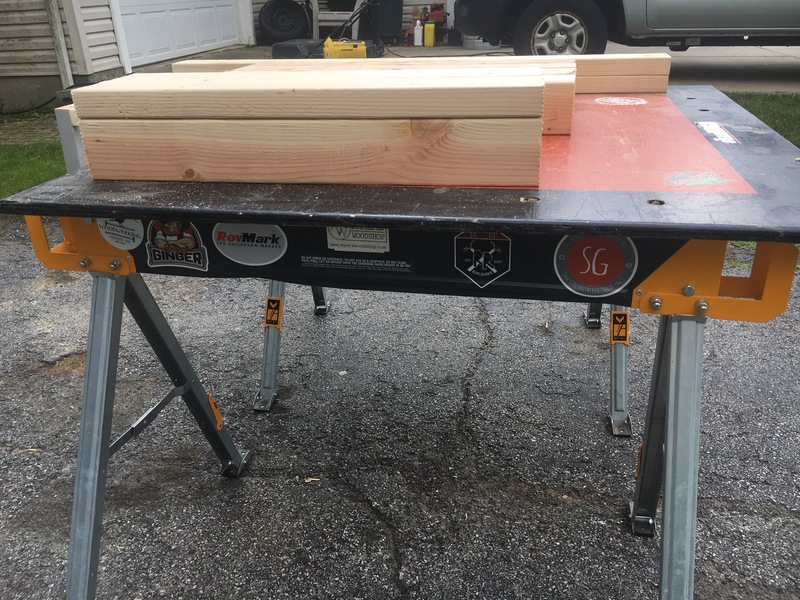 I added a pair of Tough tBuilt sawhorses from Home Depot that can quickly be put up and taken down. I complimented that with a 48 inch by 48 inch #Gingerworkstation to place on top of those sawhorses. This coupled with the addition of a retractable extension cord for sanding and using all my mobile power tools with a cord. Recently, I added the latest mobile station with lights that was written about previously and will be the new home of my Planer. As a Christian, I believe that God gives us everything that we need. I have been blessed with my space, and therefore I will be creative and use it to the best of my ability. Many folks message me and ask advice on their space. I believe the best answer is to consider a positive solution for every last inch of what you’re blessed with and then keep trying to improve it, little by little. Keep an eye out this week for some new posts on the Centipede Tool I have coming in the mail. For now, check them out here and be as amazed as I am at what it is going to do for my shop mobility!